Ready for dose deux? Meet the A-list offspring just trying to do their parents proud! Curious about the tween in the droptop Bentley that just stole your parking space? Wondering who snagged your table at Topping Rose House? Enter The Daily Summer Class of 2013. They’ve got boldface surnames and big shoes to fill, and without them, summer out East just wouldn’t be the same. 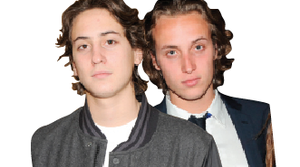 This time, let’s get to know Julian Schnabel‘s teen twins. Likely Career Path: Art. Obviously. Littlest Schnabels No More: Dad’s fiancé, May Anderson, is due this summer. Brother Knows Best: “There’s no downside to being a Schnabel,” Vito Schnabel told The New York Observer. Legit Locals: They’ve been hanging in Montauk since they were in diapers.